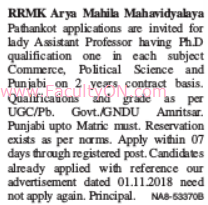 RRMK Arya Mahila Mahavidyalaya, Pathankot has advertised for recruitment of Assistant Professor jobs vacancies. Interested and eligible job aspirants are requested to apply within 07 days from 27th August 2018. Check out further more details below. About College: R.R.M.K. Arya Mahila Mahavidyalaya is managed by the ARYA VIDYA SABHA (Regd. ), which apart from this institution is also managing three other institutions, viz. Arya Senior Secondary School for Boys, Arya Senior Senior Secondary School for Girls and Smt. Mela Devi Kalra Arya Public School, Pathankot. To impart higher education to the girls of the town and sub urban areas Arya National Academy was formed in 1955 as an offshoot of Arya Girls Higher Secondary School by Mrs. S. Mohan, Former Principal of the School, with 20 Students in a hut. How to Apply: Interested and eligible candidates are requested to send application along with CV, copies of certificates / testimonials and recent passport size photos to the postal address provided below.